A total of 17 561 fungal isolates were isolated from a total of 19 800 leaf segments incubated from 33 medicinal trees. These fungal isolates belonged to teleomorphic Ascomycota (11.7%), anamorphic Ascomycota producing conidiomata (35.2%). 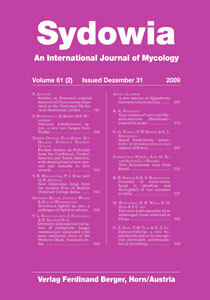 anamorphic Ascomycota without conidiomata (34.4%), Zygomycota (1.3%), and sterile forms (5.8%). Colletotrichum gleosporioides, Phyllosticta spp., Cladosporium cladosporioides, Phomopsis spp., Pestalotiopsis spp., Chaetomium globosum, and Aspergillus niger were frequently isolated from the host plants studied. The number of isolates was higher in the winter season than during monsoon and summer season. The colonization of endophytic fungi varied and differed significantly between monsoon, winter and summer seasons. Key words: endophytes, abundance, seasonality, Malnad region.